The peshtemal is highly absorbent and dries very quickly, light in weight and takes up little space meaning it's the perfect travel companion. It'S great in bathrooms, pools, spa's, beaches, sport facilities and most importantly baby care, the possibilities are endless! traditionally peshtemal is a cloth made of 100percent cotton woven on looms, it has been used to cover bodies in Turkish steam baths with a history of nearly 600 years. 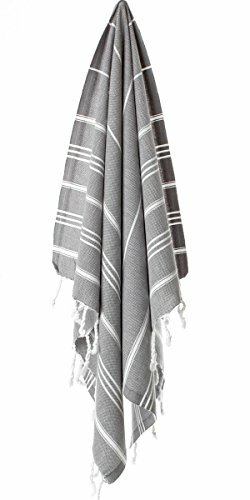 More recently peshtemal is also produced from natural fibers such as linen & bamboo.. The peshtemal bathrobe is highly absorbent and dries very quickly, light in weight and takes up little space meaning it's the perfect travel companion. It'S great in bathrooms, pools, spa's, beaches, sport facilities ! you can use your Pestemal towels for; spa, bath, gym, pool, beach, fitness, yoga towel, yacht, chair throw, picnic blanket, baby towel, clothing (sarong) highly absorbent as well fast drying. All while taking up far less space than a conventional towel. Unlike most towels , they get softer and more luscious the more you wash and use them. No deformation after frequent wash. Eco friendly. Unisex. Baby care. Leisure centers, spas, pools, saunas, gym, sport/massage facilities, in the beach as a pared. Home textile and gift retailers as cover sheet such as tables (table cloth), book shelves etc... Yoga centers massage parlor guest towel kitchen towel. If you have any questions about this product by Cacala, contact us by completing and submitting the form below. If you are looking for a specif part number, please include it with your message. Weaved Collection White Hand Towels, Basic Cotton 100% Cotton 12 Pack,15"x 25"